Our Inlet Duct and Engine Exhaust Silencers will equip a five MAN 16V 32/40 8000 KW Generators on the TCG Anadolu. The project entails no. 5 Inlet Duct and no. 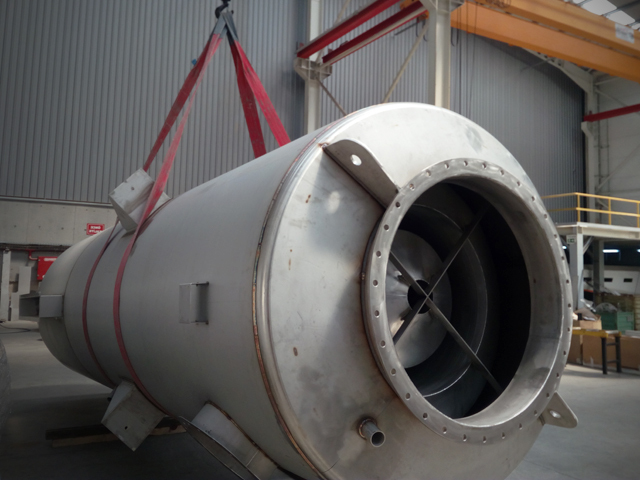 5 Engine Exhaust silencers both capable to handle 100.600 m3/h flow while achieving 35 dB(A) noise reduction. 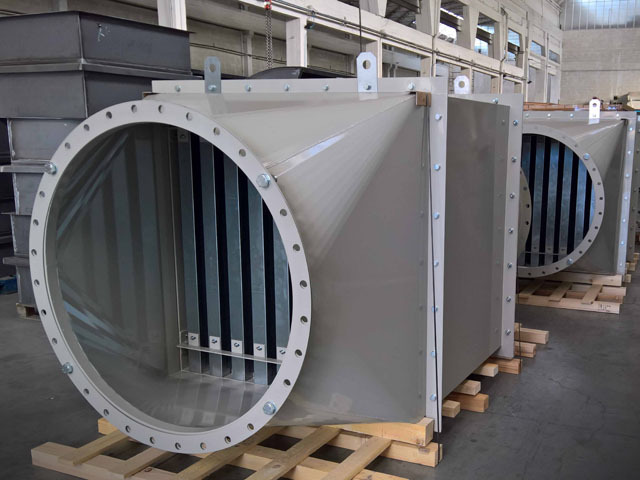 The inlet SVR model silencers are made of galvanized steel splitter panels inserted into a painted carbon steel frame with circular inlets and outlets. The exhaust silencers are made of AISI316 and derived from the Engine Exhaust SM40 DN1200 model with the addition of Spark Arrestors section to prevent the emission of flammable debris from combustion sources. Stopson Italiana’s R&D team did a great job in assessing all customer requirements and delivering a fully customized solution, thus confirming our capability to leverage our wide range of standard design products optimized around project specifications. 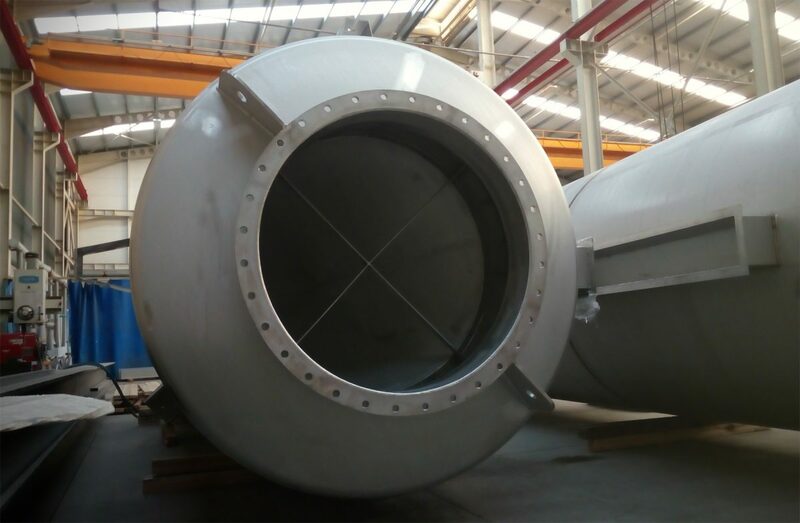 Developed in Stopson Italiana Research and Development lab, these silencers have been field-tested on numerous industrial applications. They are principally conceived to be installed on diesel and gas engines, or on industrial low/middle power gas turbines. These silencers are based on a absorption and/or resonance sound wave attenuation principle. Depending on the required attenuation performance, 5 models can be chosen: SM 15, SM 25, SM 30, SM 40, SM 50. The nomenclature represents also the nominal diameter of the inlet (e.g. SM15 ND 100, SM25 ND 200, etc). The selection of the inlet filtration system is an important stage as poor quality inlet air can significantly impact the operation, performance, and life of the engine, either gas turbine or diesel/gas engine. A great effort has been spent by Stopson Italiana’s engineers to design custom Inlet Duct air filtration systems. Stopson Italiana’ Inlet Duct Air filtration systems. In facts, marine vessels need to work even in adverse conditions, thus the continuous operation is often more important than the health of the engine itself. Multiple gas turbines are used on the ships, so there is a spare if one needs to be shut down for maintenance. That can happen in case the filter is clogged, damaged, or blocked, causing – as a consequence – excessive pressure loss. Moreover, inlet filter housings on marine vessels must be ice and corrosion resistant, due to the significant presence of salt. Generally, when we refer to a gas turbine intake, some of the consequences of poor inlet filtration entail erosion, fouling and corrosion. In order to minimize degradation, the metal components of the system needs to be constructed out of a stainless steel or aluminum with adequate corrosion resistant properties. Once a suitable filter system has been selected, a range of ductwork and filtration silencers is provided in order to reduce the noise of fast flowing air into the inlet manifold before reaching the compressor. These silencers are typically of a ‘splitter type‘ configuration, to minimize pressure drop and increase the airflow into the compressor chamber. The supply can regard even a standalone filter packages, including pulse filters for removing dust at the inlet of gas turbine packages. See more about our Industrial Silencers HERE!